With the recession in 2008, I needed to figure out what was next for me. I wanted a career shift I found interesting, where I could apply my experience and knowledge and have some level of being “recession proof”. Trade credit insurance presented that logical step. After a number of years enjoying success in the trade credit insurance niche, a fortuitous conversation with Alper’s President and CEO, David Macknin, created an opportunity with Alper to accomplish more with my knowledge and experience. It made sense to take the leap to Alper, and looking back on my tenure here, I feel confident in my decision. Has your prior experience in commercial real estate, commercial finance and owning a family business helped you to transition into insurance? Immensely. I spend so much of my time talking with CFOs and owners of small- and middle-market businesses. My experiences give me the knowledge and the vocabulary to relate to their everyday struggles and successes. My goal is to understand their business as best I can, to learn how I best add value to their operation and reduce their total cost of risk. What advice would you give someone who is considering a career in insurance? What experience would help them to be a good sales person? If you want to understand business, learn to understand people. What is unique about your job in sales in insurance? What do you like about your job? I like solving puzzles and problems. 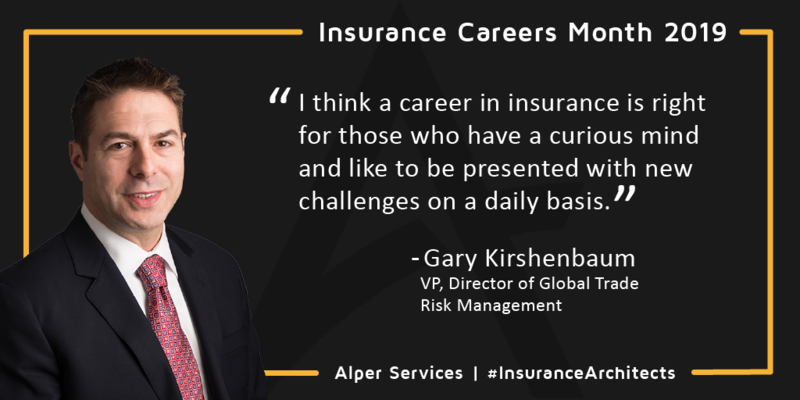 I think a career in insurance is right for those who have a curious mind and like to be presented with new challenges. Interested in an exciting career with growth opportunity? Contact HR Director Cindi Elstien for current openings at Alper Services, CElstien@AlperServices.com or click here.